The QRPGuys 40m-10m UnUnTenna Plus is a compact portable wire antenna with a built-in tuner for backyard or portable SOTA use. It is similar in design to our UnUnTenna but this device also contains a tuner. The tuner section is based on the circuit designed by Charlie Lofgren, W6JJZ, also incorporating the Dan Tayloe (N7VE) SWR led indicator. 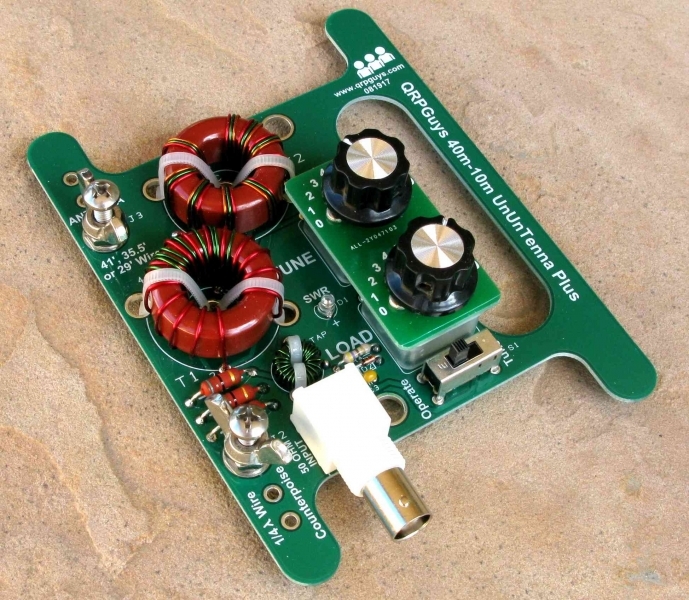 The original circuit was first designed for the Norcal QRP Club. 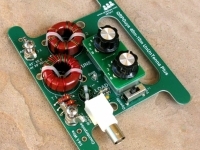 It is rated at 10 watts PEP, and uses an integral 9:1 voltage balun that matches your unbalanced 50 ohm impedance input to a 450 ohm impedance unbalanced long wire. The antenna has optimum efficiency at 20m and will be an S unit less in performance at the 40m and 10m ends. You use a non-resonate length of wire for the driven element, typically 29′, 35.5′, or 41′, and optionally a 1/4 λ wire for a counterpoise. It is designed to wind the attached wires onto the device to store it as a small compact unit. We provide all the components except the antenna wire and counterpoise wire. You use what you have available. We recommend anything from 20awg to 26awg. Two holes are provided for you to tie down or suspend the device depending on your circumstances. We provide all captive stainless steel hardware for the antenna and counterpoise connections. There is a board mounted female BNC for connection to your rig. On a difficulty scale of 1 to 5, 5 being the most difficult, this is rated at 2 or 3 depending on your experience.